This Meatless Monday post was actually made by my aunt, but it was super tasty so I got permission to put it on the blog. My aunt and uncle are mushroom hunters extraordinaire and – lucky for us! – that means we get to delight in the fungus-y spoils of their mushroom hunting trips. This pasta dish starred the morel mushroom which is a blackish brown mushroom shaped like a pine cone. It is an especially meaty mushroom with a really earthy flavor. 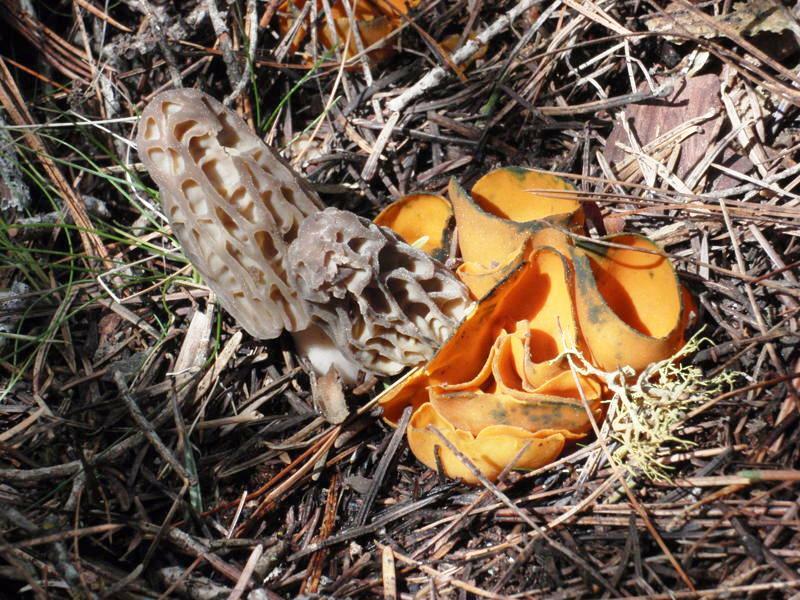 Morels are found in the Sierras following the snow melt. There are ‘naturals’ which grow in the same place every year or there are ‘burn morels’ which fruit the year after a forest fire, whether a controlled burn, an accidental burn or a lightening strike. When the conditions are right – soil temperature, moisture, elevation, canopy of the forest – they can be bountiful, but usually only for the first year. On the second year, after the burn area is bulldozed, you can usually find them in disturbed areas where the bulldozer has gone through. 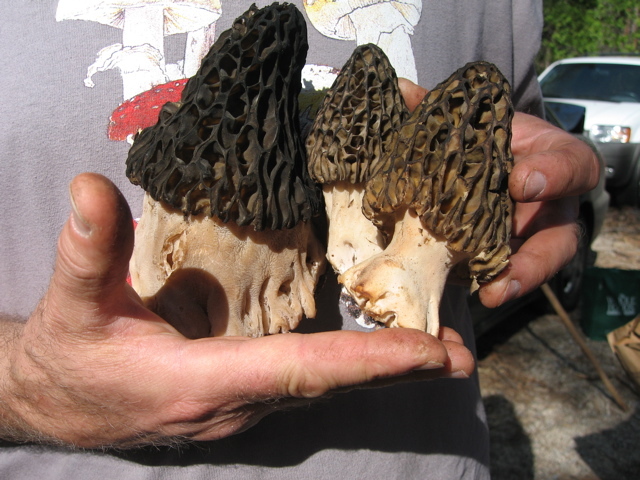 A different type of morel can also grow in wood chips – so you might be able to find them at business parks, around restaurants or anywhere else they’ve put down wood chips or tanbark – but some claim these are not as tasty as the forest dwellers. A good time to look for morels in the Sierras is when the Dogwood starts to bloom. Morels are often associated with orange peel fungus (see above), so seeing that may be an indicator of nearby morels. This was a pretty speedy supper and had only minimal ingredients, so definitely an easy midweek meal. 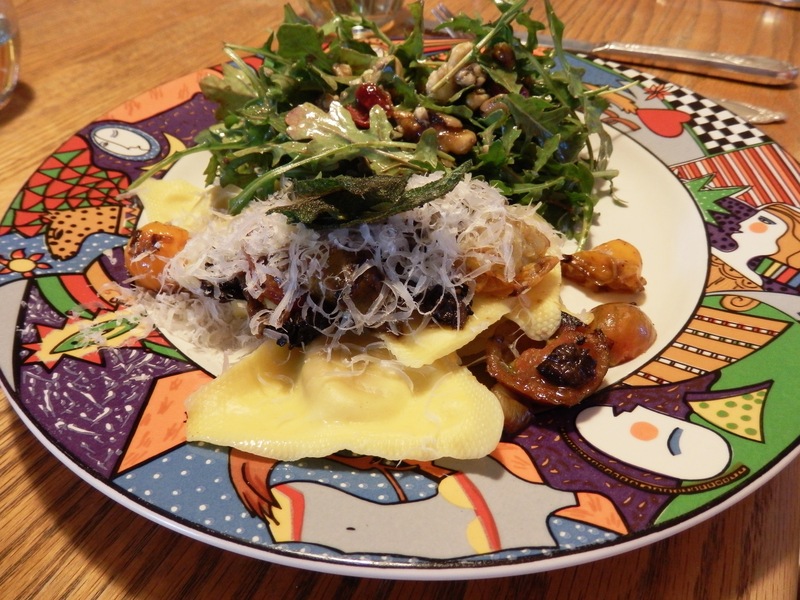 The butternut squash ravioli were store bought – roasting and pureeing butternut squash, making pasta and filling ravioli kind of seems like a lot of work, I’m still reeling from shelling all those fava beans! – and they were sweet and the filling was plentiful. The sweetness of the squash was the perfect accompaniment to the earthy mushrooms and the acidic tomatoes which had been cooked down with the sliced mushrooms and leeks to a sticky, jam-like consistency. A little bit of madeira was added at the end and cooked down to make the light sauce extra rich. A few fried sage leaves garnished the top as well as some Parmesan cheese. On the side was a salad of arugula, walnuts, dried cranberries and gorgonzola with a honey vinaigrette. All in all a fantastic dinner with meaty satisfaction sans meat!